Our toilet roll holder for cubicles is manufactured from grade 304 stainless steel with a smooth satin finish, offering a low maintenance and hygienic solution for public washroom facilities. Designed for the modern washroom in mind, this stainless steel toilet roll holder with surface fix is highly corrosion resistant. 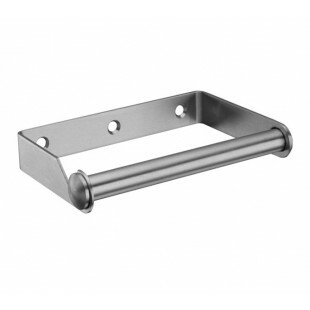 This toilet roll holder for cubicles is sold singly and supplied complete with fixing screws ready for installation onto the cubicle partition. The item measures 134mm in length and 80mm in height.